Bestow Faith is an ability with a 30 second CD that places a 5 second buff on a target which a does decent amount of healing once the buff expires. It's the default choice for raiding as it's very mana efficient and it does good healing on the target, as well as your active beacons. It does require some thought to use properly since the heal happens 5 seconds after the initial cast. Light's Hammer is an ability with a 60 second CD that heals up to 6 people in targeted area, every 2 seconds for 14 seconds. Usable on fights where the raid is stacked and there is constant AoE damage happening. However, it is very mana inefficient and most of the time outclassed even by non perfect Bestow Faith usage. Crusader's Might is used for its DPS benefits, as it allows use of our hardest hitting spell more often. While it does have some healing benefits to it, this talent is never taken for actual healing purposes as it requires you to waste too many of your precious globals on Crusader Strike to make proper use of . Generally not taken in raids, very good for dungeons. Cavalier could see use in raids if that extra charge was REQUIRED to deal with a certain mechanic. Usually taken for dungeons to be able to keep up with the group. Unbreakable Spirit could see use if more frequent use of those spells was essential to our survival. 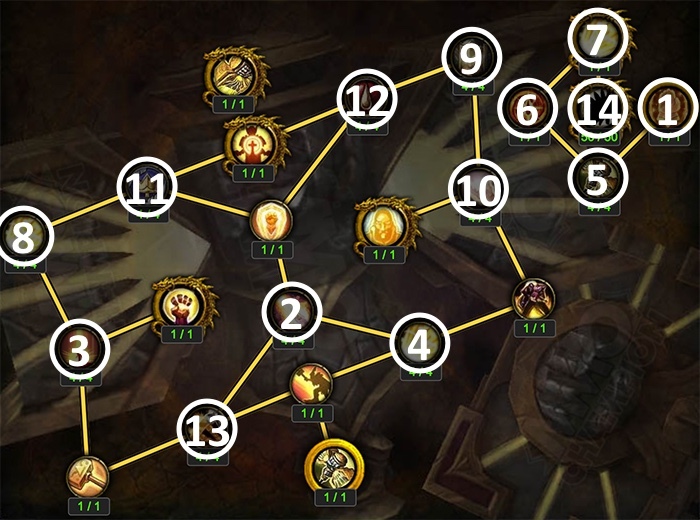 Rule of Law is our go to talent for raids, an ability that increases the reach of all our spells as well as mastery by 50%, a very flexible and versatile ability. Not used in dungeons since the group is rarely spread out and not in range. Fist of Justice is almost never taken because stuns are very common and reduced CD on ours cannot really match the versatility or strength of other 2 choices in this row. However if your group absolutely needs more stuns, the choice is here. Repentance is an ability with a 15 second CD that incapacitates the target for 60 seconds. Used in situations where you want to remove a single target out of the fight for a prolonged period. This does put you in combat so you cannot use this to skip mobs in dungeons. Blinding Light is an ability with a 90 second CD that disorients all targets within 10 yards for 6 seconds. The default choice in this row, it can be very useful as an AoE interrupt in dungeons or just as some extra free damage. Devotion Aura - The passive portion is not major in raids but the active part can be used to counteract lethal raid-wide damage making it extremely valuable and flexible for progression. Both the passive and active effects are great for dungeons making it the default choice there. Aura of Sacrifice is one of the highest HPS output spells in the game, making it very good for fights that require massive burst AoE healing. The amount duplicated is directly dictated by the amount of EFFECTIVE healing you're doing for those 8 seconds, meaning that the more cooldowns (such as wings/holy avenger) you throw into it the more healing it's going to do. Aura of Mercy does a lot of healing over the course of an encounter, the strength of this talent is that it's entirely passive and entirely free. Divine Purpose is recommended on longer fights as it saves us a lot of mana through free uses of Holy Shock and Light of Dawn. It is also good on fights where you keep Light of Dawn on CD constantly (Elisande for example). Holy Avenger is used when we need another CD to deal with the damage intake. It requires quite heavy mana usage to be effective. Default choice for dungeons. Holy Prism is never taken, it's basically a weaker version of Light of Dawn which is not buffed by any of our artifact traits. Fervent Martyr is never worth taking, vastly outclassed by the other 2 choices. Sanctified Wrath makes our Avenging Wrath even stronger. Used if a fight requires a lot of burst healing and normal Avenging Wrath is not enough . Default choice for dungeons. Judgment of Light causes Judgment to apply a debuff with 40 charges to a target, each time a friendly player strikes that target they consume a charge and heal. This does a lot of AOE healing if used on CD. Default choice for raids. Beacon of Faith gives us access to 2 beacons, very powerful on most raid fights as in most cases there are at least 2 targets (usually Tanks) taking large amounts of damage consistently. Default choice for Mythic Raiding. Beacon of the Lightbringer is strong on fights where majority of the time only 1 target is taking consistent heavy damage and on fights where we use Light of Dawn a lot. Nice benefit is that we can stand wherever and still receive full effect of our mastery on both tanks and melee in most cases. Solo tanking Star Augur Etraeus is a good example of a fight where this talent shines. Beacon of Virtue replaces Beacon of Light. It's an ability with a 15 second CD that when used places a beacon on your target + 3 injured allies within 30 yards, all 4 targets are healed for 40% of all healing you do for 8 seconds. Default choice for Mythic + dungeons, as it allows you to heal the entire group at once. All 3 are viable in a dungeon setting but from my experience you will be direct healing the tank most of the time anyway. Beacon of Virtue allows you to keep pumping the majority of healing into the tank whilst also healing the entire group. The downside of Virtue is that it is on a global cooldown and it does not have 100% up-time so bad usage can be really hurtful. Personally not to big of a fan of Beacon of Faith in dungeons as that extra beacon is often just overhealing and the actual important beacon, the one on the tank, is 20% weaker. Beacon of the Lightbringer sports a 20% stronger tank beacon (compared to Faith), gives you a stronger Light of Dawn and makes your tank+melee ALWAYS receive the full benefit of your Mastery. The downside is that you only have 1 beacon so there is 1 more person to worry about. I personally prefer Virtue but also like Lightbringer, a lot of people like Faith as well so which talent to run in dungeons really comes down to personal preference. When choosing Relics, you generally should take the one that grants you the highest item level, regardless of the benefit it offers (the exception being the first 2 traits listed which are worth losing 2-3 item levels over). When having to choose between Relics that grant the same item level, choose based on the list bellow.